Cohen J.A., Bulmer B.J., Patton K.M., Sisson D.D. Aortic dissection associated with an obstructive aortic chondrosarcoma in a dog // J Vet Cardiol. 2010 Dec;12(3):203-10. A 6-year-old, 35-kg, female spayed German wirehaired pointer was referred for evaluation of collapse/seizure-like activity and a suspected mediastinal mass. Echocardiographic examination revealed an obstructive, intraluminal aortic mass with aortic dissection. 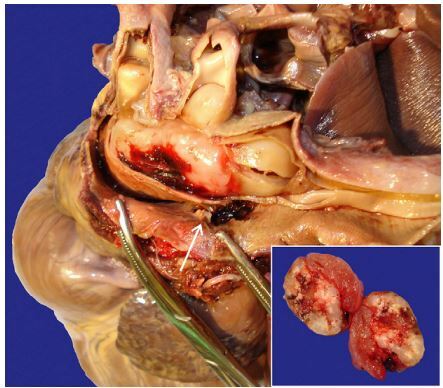 Gross and histopathological findings confirmed the aortic dissection with right pulmonary artery compression and an aortopulmonary fistula. The mass was histologically consistent with an intraluminal chondrosarcoma. 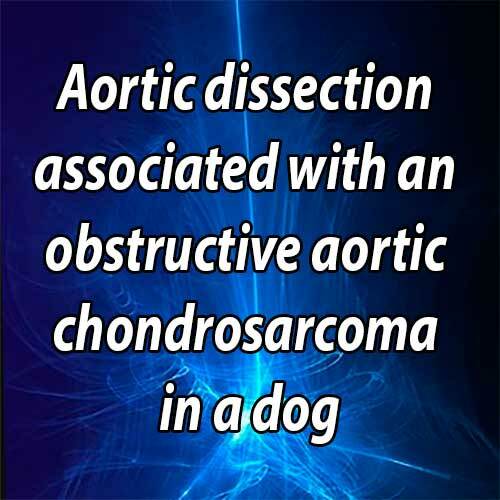 To the authors knowledge this case represents only the second case of aortic chondrosarcoma in a dog, and interestingly the first case in either a dog or human to have aorticdissection associated with aortic obstruction by an intraluminal aortic tumor. A 6-year-old female spayed German wirehaired pointer weighing 35 kg was presented to the Oregon State University, Veterinary Teaching Hospital (OSU — VTH) in August 2008 for evaluation of collapse/ seizure-like activity. Six days prior to evaluation at OSU the dog had an episode of collapse while walking, from which she quickly recovered. Two days later the dog collapsed and was unresponsive for 15 min. She was taken to an emergency referral center and was stabilized overnight with oxygen and fluids. The following day, an electrocardiogram (ECG) revealed sinus arrhythmia and thoracic radiographs revealed pleural effusion, a widened mediastinum and a mineralized opacity cranial to the heart. Mild to moderate pleural effusion and a potential mass cranial to the heart were seen with thoracic ultrasound. A CT scan performed the next day showed a mineralized structure distal to the aortic bulb with dilation of the ascending aorta and a non-contrast enhancing mediastinal mass. The mediastinal mass appeared to compress the right pulmonary artery. An ovoid hypoattenuating, non-contrast enhancing area extending proximally from the mineralized structure was also identified. The dog was referred to OSU for further diagnostics and potential surgical exploration the following morning. On presentation to OSU — VTH the dog was ambulatory but depressed with a temperature of 103.1 F, heart rate of 132 bpm, and she was panting. There were no audible murmurs although auscultation was impaired by the panting. A complete blood count revealed a mild neutrophilia (12,289/ pL, reference range 3000—11,400/pL) and thrombocytopenia (144	K/pL,	reference range 200—900 K/pL) with normal red blood cell count (6.07 x 106/pl, reference range 5.5—8.5 x 106/pL) and hematocrit (41.2%, reference range 37—55%). Blood chemistry showed mildly decreased BUN (8 mg/dL, reference range 10—30 mg/dL) and creatinine (0.7 mg/dL, reference range 1—2 mg/dL) and hypokalemia (3.8 mEq/L, reference range 4—5.7 mg/dL). Shortly after presentation to the VTH the dog became agitated and dyspneic with a heart rate of 225 bpm. An ECG revealed sinus tachycardia with a heart rate of 230 bpm and criteria for right atrial (P wave amplitude of 0.8 mV) and right ventricular (S wave amplitudes of 1.2 mV in lead II, 1.0 mV in lead CV6LL, 0.8 mV in lead CV6LU) enlargement. An echocardiogram showed moderate to severe right ventricular and right atrial enlargementwith severe leftventricularconcentric hypertrophy (Video 1, Table 1). Moderate tricuspid valve insufficiency was present with a maximal velocity of 4.4 m/s. A 1.4 cm x 3.4 cm mineralized hyperechoic mass obstructed the lumen of the ascending aorta with subsequent aortic dissection originating from the sinus of the non-coronary cusp of the aortic valve (Video 2, Table 1). Systolic flow occurred through the aortic dissection (Video 3, Table 1) with a maximal velocity of 4.6 m/s. Continuous flow from the main pulmonary artery (MPA) to the right pulmonary artery (RPA) was present (Video 4, Table 1) with a systolic maximal velocity of 3.4 m/s. A second jet of continuous flow was identified entering the MPA (Video 4) with a systolic maximal velocity of 2.2 m/s. Cardiac catheterization and selective angiocardiography were offered to further evaluate the complex echocardiographic Doppler findings and to try and determine if surgical treatment was an option. However, due to the dog’s deteriorating condition and overall poor prognosis without access to cardiac bypass, the owner elected to euthanize the animal. The owner agreed to an in-house post-mortem examination and 200 ml of serosanguinous fluid was collected from the thoracic cavity. An extensive, approximately 20 cm in length well-organized hematoma spanned along the aorta from the cranial mediastinum, surrounding the aortic arch and ascending aorta, to nearly the level of the diaphragm (Fig. 1). At the heart base the hematoma enveloped and compressed the RPA. Careful dissection and reflection of the hematoma revealed two sites of perforation in the aortic adventitia of the false lumen. An approximately 1 cm transversal tear was identified adjacent to the origin of the left subclavian artery (Fig. 2). A 1.5-cm longitudinal tear was also identified on the extreme ventral aspect of the aorta (Fig. 3) approximately 1.5 cm caudal to the first tear. Longitudinal sectioning of the thoracic aorta revealed an extensive dissection between the arterial tunica intima and the tunica media and adventitia, creating a pseudo or false lumen between the tunica intima and tunica media. 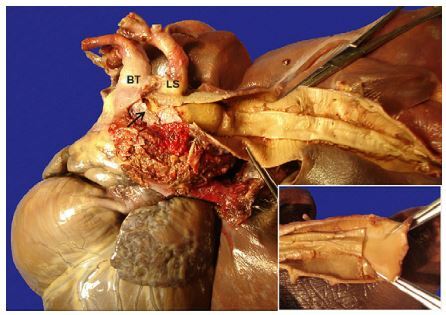 Mural dissection of the thoracic aorta extended approximately 12 cm beyond the left subclavian artery (Fig. 2). A firm, rubbery to gelatinous, grey, 1.2 cm x 1.3 cm x 6.5 cm multilobular, mass with a smooth, but irregularly bulging contour filled and completely obstructed the true aortic lumen as it extended into the brachiocephalic trunk and left subclavian arteries (Fig. 3). The architecture of the mass changed to an encapsulated structure that was mineralized on cut surface as it extended further cranially to within 2 cm of the tips of the aortic valve leaflets. Although difficult to tell due to the obstructing nature of the mass, it appeared adhered to the intimal aortic wall just proximal to the origin of the brachiocephalic trunk and left subclavian arteries. On section, the mass contained several white, chalky, mineralized regions interspersed within a homogenous gelatinous, but firm grey, glistening matrix. A 4-mm intimal tear was identified within the non-coronary aortic valve sinus (Fig. 4) marking the origin of the aortic dissection. Approximately 50% of the circumference of the main pulmonary artery and a portion of the left pulmonary artery also displayed dissection. A 5-mm pulmonary artery intimal tear was identified just above the cranial leaflet of the pulmonary valve (Fig. 5). There were no other primary tumors or metastasis identified on gross examination. Longitudinal sectioning of the thoracic aorta revealed extension of the aortic dissection approximately 12 cm beyond the left subclavian (LS) artery before its abrupt termination (inset) and presumed recommunication with the aorta. Although the mass is still hidden by the true aortic lumen, it extended well beyond the origin of the LS artery. BT: brachiocephalic trunk. 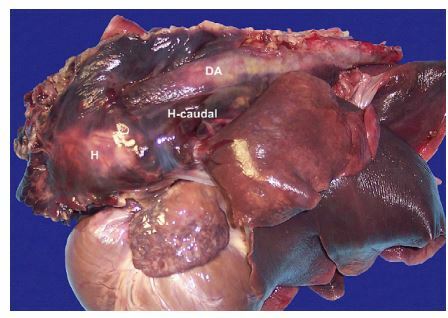 Sections of liver, kidney, spleen, perirenal mesenteric lymph node, pancreas, hematoma surrounding the aorta, multiple pieces of intraaortic mass as well as the entire heart, lung and dissected aorta were placed in 10% neutral buffered formalin and submitted to the OSU Veterinary Diagnostic Laboratory for histopathological evaluation. 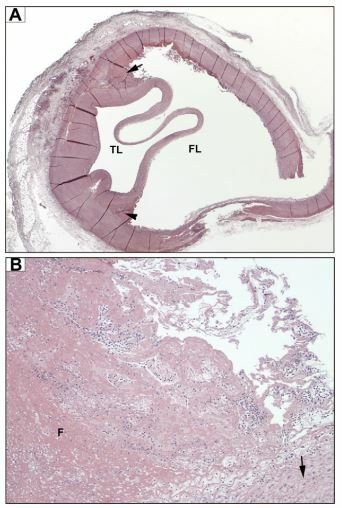 Fixed tissues including portions of lung and heart, aortic base and rupture near the aortic valve, were sectioned and placed into cassettes, processed using a VIP 5 tissue processor, embedded in paraffin, sectioned on a rotary microtome at 5 mm, and stained with routine hematoxylin and eosin stain. Sections of the mass were stained with Alcian Blue. Sections of the aorta at the site of dissection as well as proximal and distal to the dissection were stained with Masson’s Trichrome and Verhoeff’s for evaluation of elastin fibers. A second perforation through the false aortic lumen (arrow) was identified yielding further hemorrhage into the mediastinum. The most cranial aspect of the mass (inset) was mineralized on cut surface. 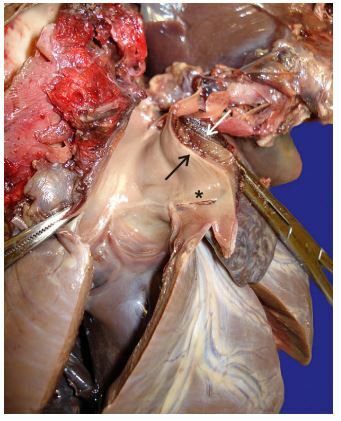 The dissection occurred through the tunica media separating the intimal surface of the aorta (black arrows) from the principle component of the tunica media and adventitia (white arrows). The smooth border of intimal discoloration represents the termination of the most proximal aspect of the aortic mass. The mass seemed adhered to the roughened intimal surface (black asterisk) at the origin of the brachiocephalic trunk and left subclavian arteries. Histopathologic examination of the mass consisted of variably sized nodules composed of a background of homogeneous Alcian blue positive proteoglycan matrix (cartilage matrix) that is supporting dispersed, moderately pleomorphic oval or stellate cells within clear vacuoles or lacunan (chondrocytes) (Fig. 6). The cells had evenly dispersed chromatin and indistinct cytoplasm, with mild anisocytosis and moderate anisokaryosis. The matrix was multifocally mineralized, and the variably sized nodules were separated by clefts and bands of fibrous connective tissue. An active blood supply was seen. Mitotic figures were not seen in any of the sections. The mass was attached to the tunica intima as a thin band of connective tissue and endothelial cells were covering the mass. Due to the cytological features of anisokaryosis and anisocy- tosis, formation of chondroid matrix and the mass location, the mass was consistent with an intravascular low grade chondrosarcoma. The dissection of the aorta occurred in the tunica media separating the elastin fibers of the media (Fig. 7). Marked hemorrhage, fibrin and neutrophils were seen at the cleft of the dissection. There was no evidence of endothelial cells lining the dissection. Elastin and collagen fibers of the aorta adjacent to and distant from the site of the dissection were morphologically normal with Masson’s Trichrome and Verhoeff’s stain. Disorganized bands of hemorrhage and neovascular tissue were found extending away from the aorta within the mediastinal tissue as well as dissecting between the myofibers of the heart immediately adjacent to the aortic rupture. Sections of liver had mild centrilobular hepatocellular congestion and sinusoidal atrophy consistent with mild passive congestion. The alveolar walls of the lung were congested and within the hilar regions, marked hemorrhage expanded the perivascular spaces of the large, muscular arteries. No macrophages ("heart failure cells”) were seen in the lung sections. Sections of the kidney, pancreas and spleen were within normal limits. A final diagnosis of intravascular chondrosarcoma with acute spontaneous aortic dissection was given. 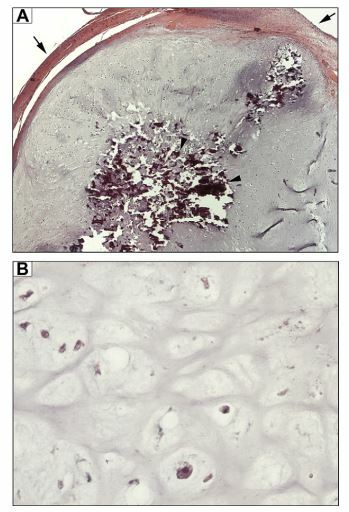 Although histopathology was unable to be performed to demonstrate where the cleft occurred the gross appearance suggests separation of the tunica intima (black arrow) from the principle component of the tunica media and adventitia (white arrow). (A) 10x magnification. The true lumen (TL) is rimmed by a variably thick wall separating it from the false lumen (FL). The arrow and arrowhead denote the separation of the tunica media with accumulation of cellular debris, fibrin and neutrophils which extend along the tunica media and focally into the surrounding adipose to form a very small communication. The close-up is taken at the region denoted by the arrowhead. The dark band-like folds are artifacts due to sectioning. (B) 200x magnification. A massive accumulation of cellular debris, fibrin (F) and degenerate neutrophils fill the angle formed at the base of the false lumen. The arrow highlights the remaining elastin fibers of the tunica media making up the outer wall of the false lumen. 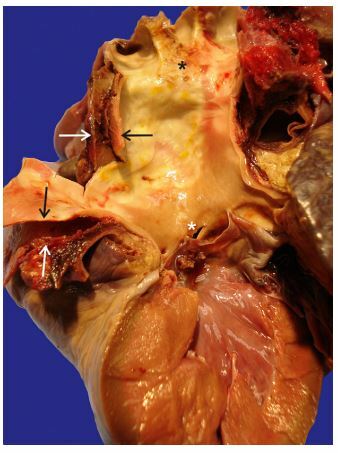 Spontaneous aortic dissection is a rare and often acutely fatal disease in dogs 1-4 wherein an intimal tear allows blood to penetrate and dissect the tunica media of the aorta. The intraluminal aortic pressure serves as a driving force for pulsatile flow into the false lumen enabling the dissection to progress, normally in an antegrade fashion.5 Blood pressure, underlying aortic pathology, and the rate of acceleration of the pulsatile flow are the principal determinants in the propagation of aortic dissection. Some cases of aortic dissection have also been attributed to aortic intramural hemorrhage from rupture of the vaso vasorum into the aortic wall with or without a resultant intimal tear. Following dissection the false lumen may compress or obstruct the true aortic lumen or those of adjacent vessels, remain patent as a blind false lumen, be occluded by thrombosis, re-communi- cate with the true lumen by fenestration, or rupture into potential spaces including the pericardial, pleural, or peritoneal cavities.5 Dissection rupture, most commonly into the pericardial sac, is reportedly the most common cause of death in people.6 The false lumen in this case displayed several of these outcomes. Based on the animal’s ability to ambulate normally and the CT finding of contrast within the aortic lumen beyond the chondrosarcoma it is hypothesized the dissection recommunicated at its distal end with the true aortic lumen. However, antegrade flow around the mass within the true aortic lumen or flow from the false lumen into the true lumen through the origins of the vertebral arteries cannot be excluded as the means for distal perfusion. The false lumen had two tears into the mediastinum where extensive hematoma formation occurred adjacent to the brachiocephalic trunk and left subclavian arteries, at the heart base, and along the length of the descending thoracic aorta. The hematoma at the heart base contributed to a rare but well characterized consequence of aortic dissection, right pulmonary arterial extraluminal compression.7-16 Extraluminal compression may be a consequence of either aortic dilation associated with formation of the false lumen or secondary to rupture of the false lumen with subsequent hematoma formation. This case displayed both forms of compression. The false lumen appeared to impinge the MPA on echocardiography and the extravascular hematoma compressed the RPA on the CT scan and on necropsy. This case was further complicated by pulmonary artery dissection and development of an intimal tear with subsequent communication between the aortic dissection and MPA. Although the exact communication between the aortic and pulmonary arterial dissections was apparently obscured during dissection of the overlying hematoma, the Doppler echocardiographic findings suggest left to right shunting of blood into the main pulmonary artery. This rare consequence of aortopulmonary fistulation has also been detailed in humans with aortic dissection.17-23 The combination of right pulmonary arterial obstruction and left to right shunting into the MPA likely contributed to the echocardiographically identified right heart enlargement and pulmonary hypertension estimated at 87 mm Hg [4(4.4 m/s) + estimated 10 mm Hg in the face of right atrial enlargement]. That differs from the current case where we hypothesize the obstructive chondrosarcoma was ultimately responsible for all of the clinical, echocardiographic and pathological findings. Although the exact time course in relation to the clinical signs is hard to detail, we believe the aortic obstruction and local hypertension ultimately led to aortic dissection at the sinus of the non-coronary cusp of the aortic valve. The origin of the dissection and its close proximity to the pulmonary artery enabled impingement and ultimately perforation into the main pulmonary artery. The false lumen ruptured in two additional locations enabling an extensive hematoma to form adjacent to the brachiocephalic trunk and left subclavian arteries, at the heart base, and along the length of the descending thoracic aorta. The hematoma compressed the right pulmonary artery, and in combination with the left to right shunt into the main pulmonary artery produced pulmonary hypertension and right heart enlargement with tricuspid valve insufficiency. The left ventricular concentric hypertrophy was presumably a combination of true hypertrophy secondary to hypertension and pseudo hypertrophy due to a reduction in preload induced by pulmonary hypertension. To the authors’ knowledge this case represents only the second case of aortic chondrosarcoma in a dog, and interestingly the first case in either a dog or human to have aortic dissection associated with aortic obstruction by an intraluminal aortic tumor. The catastrophic consequences following aortic dissection and the lack of ready access to cardiac bypass and surgeons experienced with aortic grafting provided a poor prognosis and ultimately led to euthanasia. Bevilacqua G, Camici P, L’Abbate A. Spontaneous dissecting aneurysm of the aorta in a dog. Vet Pathol 1981;18:273-275. Waldrop JE, Stoneham AE, Tidwell AS, Jakowski RM, Rozanski EA, Rush JE. Aortic dissection associated with aortic aneurysms and posterior paresis in a dog. J Vet Intern Med 2003;17:223-229. Boulineau TM, Andrews-Jones L, Van Alstine W. Spontaneous aortic dissecting hematoma in two dogs. J Vet Diagn Invest 2005;17:492-497. Selvaraj J, Sridhar R, Manohar BM. Dissecting aortic aneurysm in a dog. Indian J Anim Sci 2004;74:743-744. Patel PD, Arora RR. Pathophysiology, diagnosis, and management of aortic dissection. Ther Adv Cardiovasc Dis 2008;2:439-468. Hirst Jr AE, Johns JrVJ, Kime JrSW. Dissecting aneurysm of the aorta: a review of 505 cases. Medicine (Baltimore) 1958; 37:217-279. Buja LM, Ali N, Fletcher RD, Roberts WC. Stenosis of the right pulmonary artery: a complication of acute dissecting aneurysm of the ascending aorta. Am Heart J 1972;83:89-92. Nasrallah A, Garcia E, Hall RJ. The syndrome of compression of the pulmonary artery by dissecting aneurysm of the aorta. Cardiovasc Dis 1974;1:186-190. Nasrallah A, Goussous Y, El-Said G, Garcia E, Hall RJ. Pulmonary artery compression due to acute dissecting aortic aneurysm: clinical and angiographic diagnosis. Chest 1975;67:228-230. Charnsangavej C. Occlusion of the right pulmonary artery by acute dissecting aortic aneurysm. AJR Am J Roentgenol 1979;132:274-276. Kutcher WL, Kaufman BS. Occlusion of the right pulmonary artery by an acute dissecting aortic aneurysm. Crit Care Med 1988;16:564-565. Worsley DF, Coupland DB, Lentle BC, Chipperfield P, Marsh JI. Ascending aortic dissection causing unilateral absence of perfusion on lung scanning. Clin Nucl Med 1993; 18:941-944. Rau AN, Glass MN, Waller BF, Fraiz J, Shaar CJ. Right pulmonary artery occlusion secondary to a dissecting aortic aneurysm. Clin Cardiol 1995;18:178-180. Neri E, Toscano T, Civeli L, Capannini G, Tucci E, Sassi C. Acute dissecting aneurysm of the ascending thoracic aorta causing obstruction and thrombosis of the right pulmonary artery. Tex Heart Inst J 2001;28:149-151. Masuo M, Takano H, Takamoto S, Tanaka J, Kitamura S, Saito T. Pulmonary artery obstruction caused by thoracic aortic dissection: a case with unique pathological findings. Circ J 2004;68:392-395. Sheu JJ, Fu M, Lee FY, Ng SH, Wan YL, Ko SF. Ascending aortic dissecting aneurysm with isolated right pulmonary arterial medial intramural hematoma. Ann Thorac Surg 2008;85:2127-2128. Veerbeek AG, van der Wieken LR, Schuilenburg RM, Bloemendaal K. Acquired aorto-pulmonary fistula in acute dissection. Eur Heart J 1992;13:713-715. Coselli JS, LeMaire SA, van Cleve GD. Rupture of a dissecting thoracic aortic aneurysm into the pulmonary artery: successful surgical repair. Cardiovasc Surg 1995;3: 697-701. Massetti M, Babatasi G, Saloux E, Bhoyroo S, Khayat A. Aorto-pulmonary fistula: a rare event in the evolution of a dissecting aneurysm of the thoracic aorta. Eur J Cardiothorac Surg 1997;11:994-996. Atay Y, Can L, Yagdi T, Buket S. Aortopulmonary artery fistula. Presenting with congestive heart failure in a patient with aortic dissection. Tex Heart Inst J 1998;25:72-74. Piciche M, De Paulis R, Chiariello L. A review of aortopulmonary fistulas in aortic dissection. Ann Thorac Surg 1999;68:1833-1836. Agarwal K, YadavMK. Aortic dissection with aortopulmonary artery fistula. Indian Heart J 2006;58:164-165. Spier LN, Hall MH, Nelson RL, Parnell VA, Pogo GJ, Tortolani AJ. Aortic dissection: rupture into right ventricle and right pulmonary artery. Ann Thorac Surg 1995;59: 1017-1019. SebenikM, Ricci Jr A, DiPasquale B, Mody K, Pytel P, Jee KJ, Knuutila S, Scholes J. Undifferentiated intimal sarcoma of large systemic blood vessels: report of 14 cases with immunohistochemical profile and review of the literature. Am J Surg Pathol 2005;29:1184-1193. Geib LW. Primary angiomatous tumors of the heart and great vessels. A report of two cases in the dog. Cornell Vet 1967;57:292-296. Ranck RS, Linder KE, Haber MD, Meuten DJ. Primary intimal aortic angiosarcoma in a dog. Vet Pathol 2008;45:361-364. Anderson WI, Carberry CA, King JM, Trotter EJ, de Lahunta A. Primary aortic chondrosarcoma in a dog. Vet Pathol 1988;25:180-181.